The dominant religions of Sanya are Buddhism, Taoism, Islam and Christianity. Nanshan Cultural Tourism Zone includes the Nanshan Buddhist temple and a statue of Kwan-yin Buddha, standing a staggering 108 meters tall. Taoism ceremonies are held locally every year, in Fenghuang town there are 6 mosques and there is a Christian church located in Hongsha town. Dragon Head Raising Day falls on the second day of the second lunar month, it is a traditional festival celebrated in many regions of China, most notably it's celebrated by Han Chinese and also the Miao & Li minorities. Like many traditional festivals its roots are firmly anchored in the rural past, the dragon was believed to have power over wind and rain it is hoped that the dragon will ensure sufficient rain for the farming season, make farming conditions easy and ensure fruitful harvests. 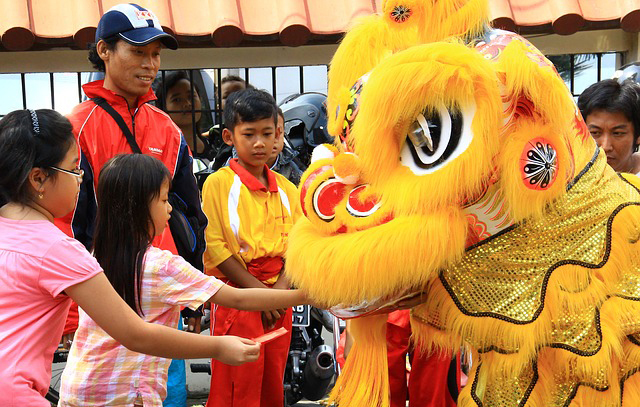 Dragon dancers are a common sight all across China for the festival. The Sanyuesan Festival is the largest traditional festival of the Li and Miao minorities in Hainan Province, and takes place on the 3rd day of the 3rd lunar month of the year. It is a day to express love through singing and dancing and competitions are held; the festival is also viewed as "Valentines' Day" by Li and Miao minorities. 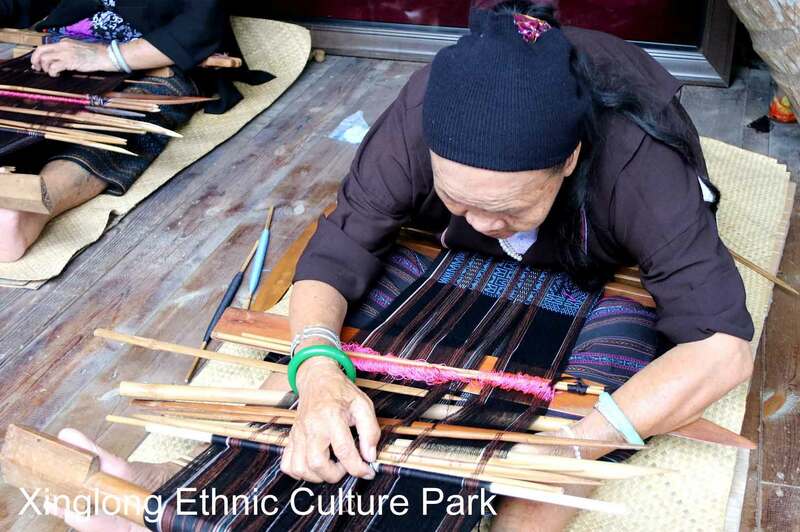 Over two days, various activities including Li and Miao brocade weaving and embroidery competitions, folk performances, exhibitions of intangible cultural heritage of minority peoples, traditional ethnic athletic competitions and ethnic food exhibitions are put on for tourists. 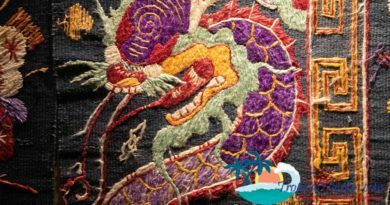 The Dragon Boat Festival is held in honour of the ancient poet Qu Yuan 屈原 who drowned approximately 2300 years ago on the fifth day of the fifth month of the lunar calendar. 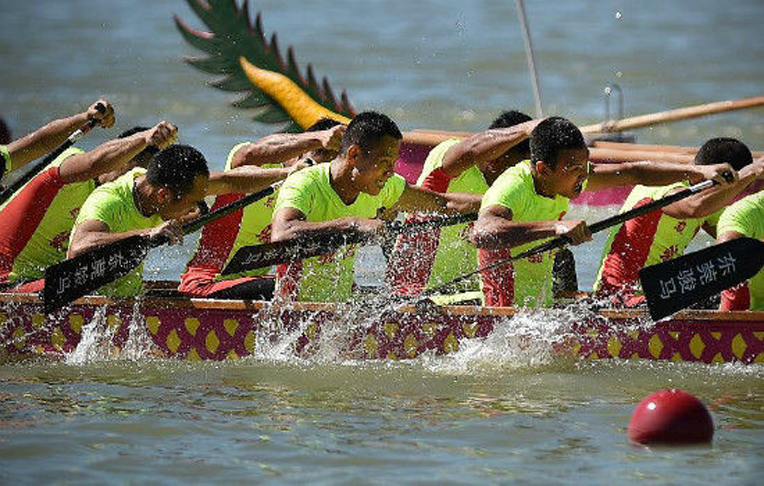 In Hainan the Dragon Boat Race is held at the mouth of the Sanya river, and crowds flock to cheer on their teams. Traditionally, zongzi (sticky rice cooked in banana leaf) are eaten, the parks are filled with people flying kites and locals go to the rivers and beaches to wash and splash each other with “Dragon Water” to pray for health and wealth for the whole year. Mid-Autumn Festival falls on the 15th day of the 8th lunar month which is usually in October. In ancient China, emperors offered sacrifices to the sun in spring and to the moon in autumn. By the Ming dynasty (1368-1644) it had grown to be a major festival of China involving not just royalty but the general population. Tradition tells of how a hero Hou Yi's wife Chang E transformed into a celestial being who's shadow could be seen on the moon. In mourning for his wife Hou Yi held a memorial ceremony under the full moon. 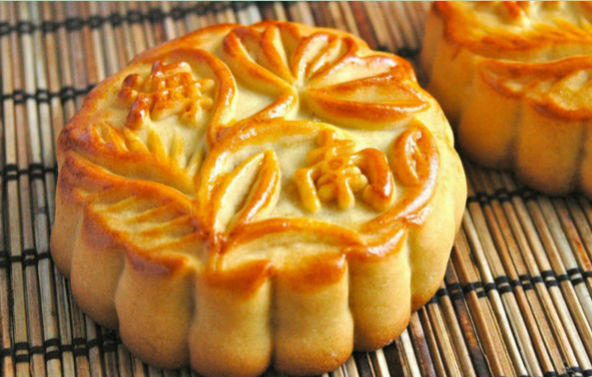 The traditional food for "moon cake day" is of course moon cake, a gelatinous cake sometimes containing seeds, nuts and egg yolk. The Nanshan longevity festival is held on the 9th day of the 9th lunar month, (known as the Chongyang Festival in other parts of China). 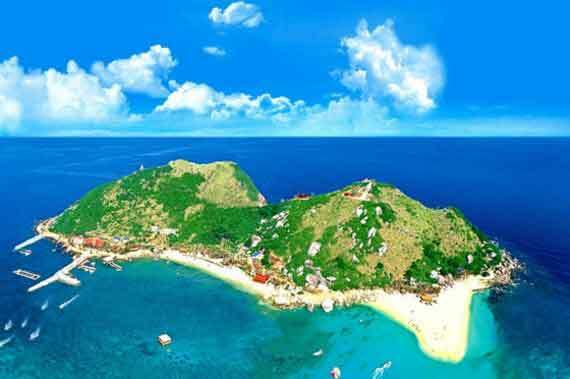 Hainan is known as the long life Island and residents are amongst some of the longest lived people in the world. 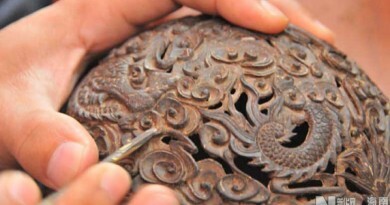 The Nanshan Longevity Festival, held at Sanya's Nanshan Temple, celebrates Hainan's oldest men and women. At the festival, large photos of the elderly are put on display, and awards are given to the oldest living Hainanese. 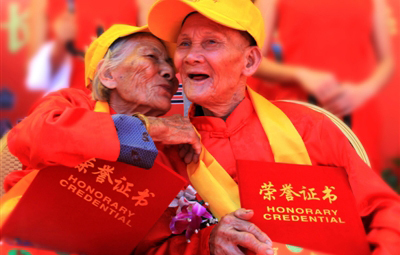 The number of centenarians in Hainan has now reached 1,944, which means that 21.46 per 100,000 citizens residing in the province are over 100 years of age. Hainan has the largest population of citizens over 100 years old in China. 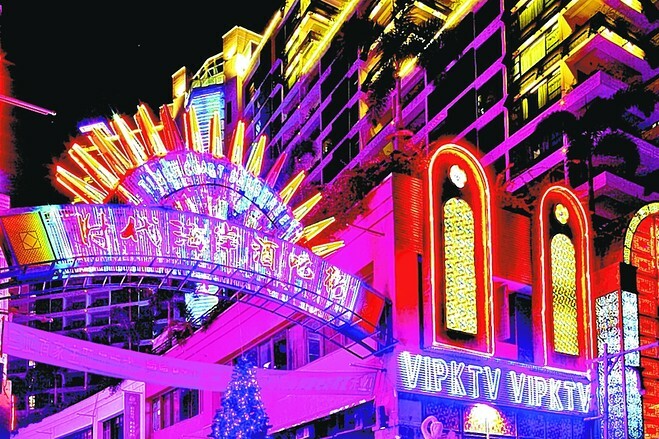 Held on November 18th the Tianya Haijiao wedding festival is, as you've already guessed a celebration of marriage. It attracts newly married couples, couples celebrating their golden and silver wedding anniversaries, and just about any couple with romantic inclinations. The story goes that in ancient times, two young lovers eloped when their parents disapproved of their marriage, realising that they were about to be caught with no way to escape they jumped into the sea together. There was a thunderstorm, they were hit by lightning and changed into two stones. 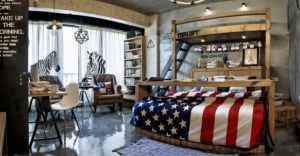 Budget hotels and hostels in Sanya: Accommodation is one of the biggest fixed costs travellers have and reducing that cost can lead to big savings! 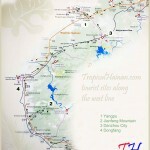 At tropicalhainan.com we know that accommodation can eat into any travel budget, so here are some of the top budget hotels and hostels in Sanya. We provide a one-step travel search engine, that allows you to search and compare hotels and vacation packages from the biggest travel companies, travel agents, aggregators and special negotiators to get the best prices. 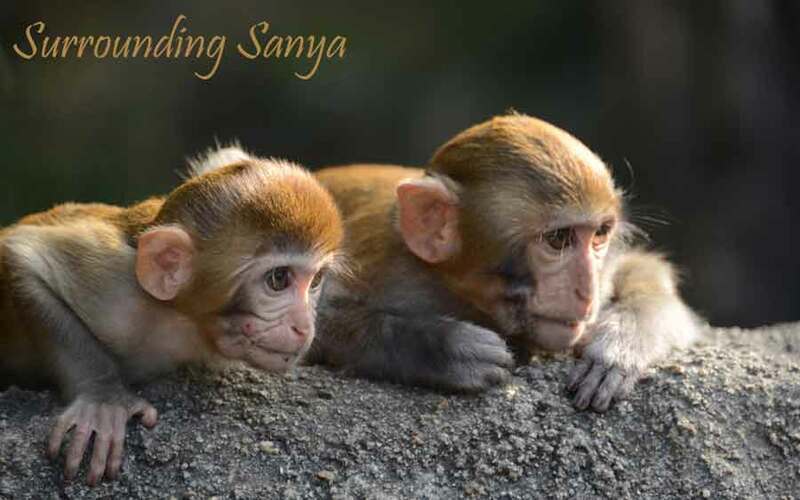 Want more than just Sanya? 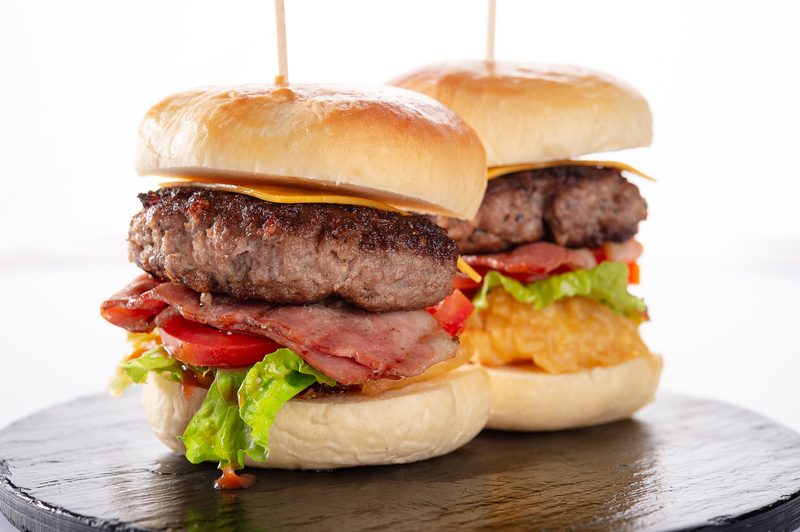 get off the beaten track! 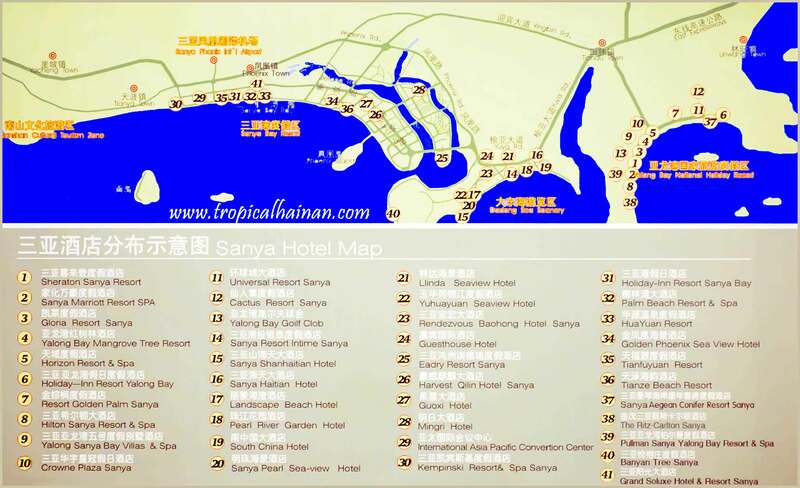 Want to get off the beaten track and get out of Sanya for a while, here are some routes to get you started. 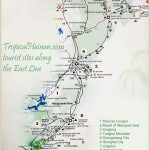 There are plenty of things to see and do along the West, Central and Eastern lines, you'll find its definitely worth it. Lingshui Li Autonomous County (No, 7 on the east line) is in the south east of Hainan, about 70 km north east of Sanya City. Lingshui covers a land area of approximately 1128 square kilometres and is home to mostly Han, Li and Miao peoples. 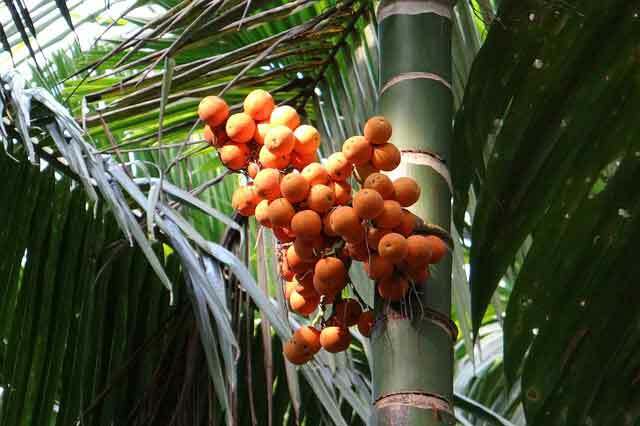 It has a reputation as being a "natural greenhouse" and it has a fantastic variety of tropical crops. It's also known for its sea pearls and wonderful gulf views. 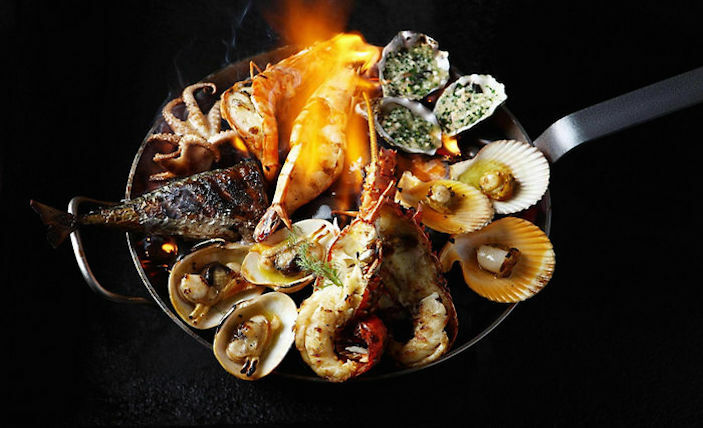 Local specialties include Lingshui sour noodles, loquat crab, scallops & fish porridge. 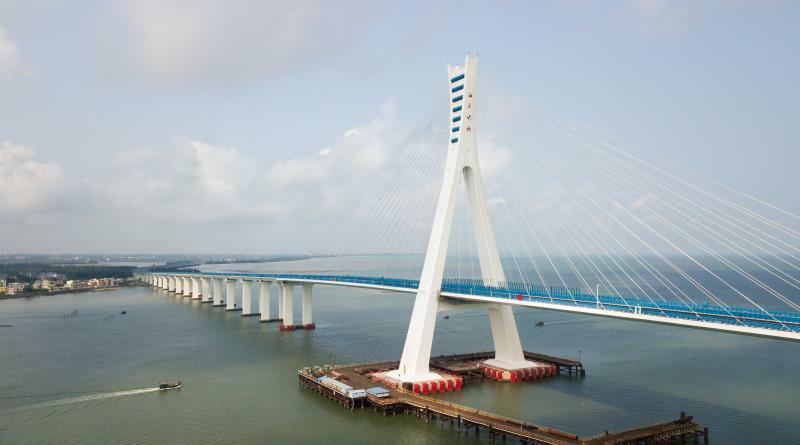 Boundary Island is located at the border of Lingshui and Wanning (No. 168 on the east route), it's a beautiful small island just off the coast in Riyue Bay. It was uninhabited until about the 18th century and it's a natural wonderland, dolphins and whale sharks are common around the Island. The island offers many exciting sports and activities including scuba diving, yachting, sailing, swimming, hiking, volleyball, parasailing, a sightseeing submarine and more. 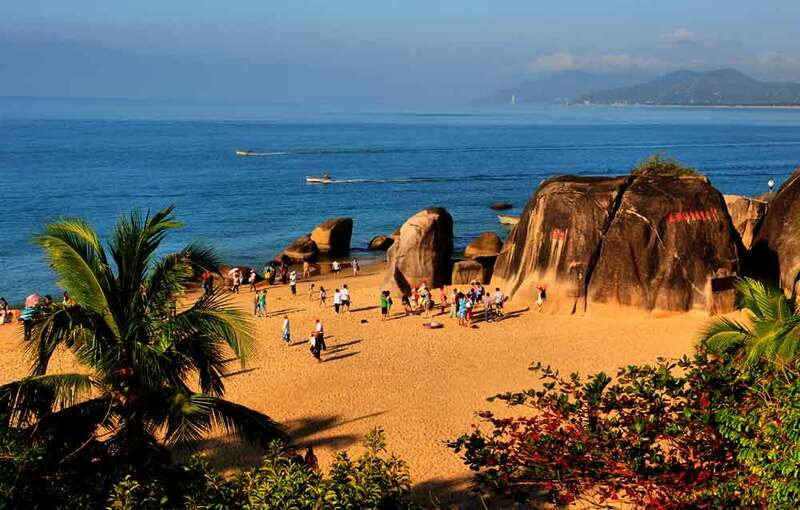 Nanwan Monkey Island is located in Lingshui County of Hainan Province (No. 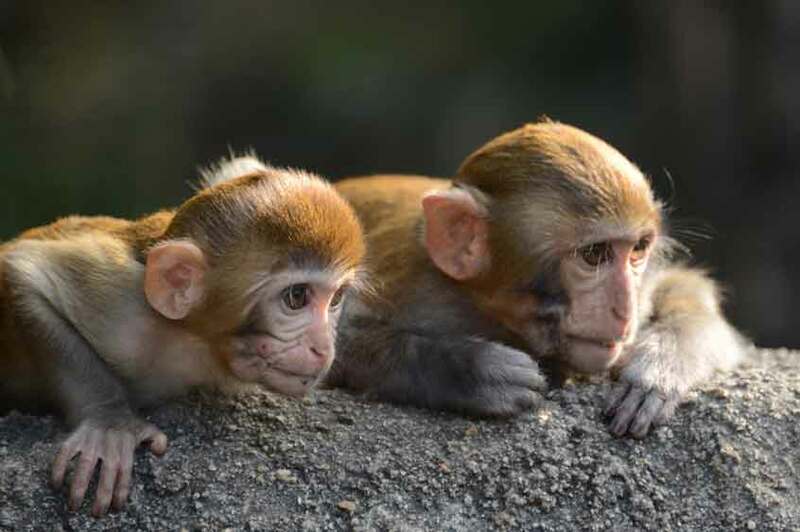 257 on the east route), and it's home to more than 1,500 Macaques a class 2 protected species in China. It is the only island reserve for monkeys in China and as well as being a monkey reserve it's also nature reserve in general. Many of the monkeys have been spoiled by tourists giving them food over the years, which is bad for their health and teaches them bad habits. Please don't feed the monkeys, as they have plenty of food of their own. 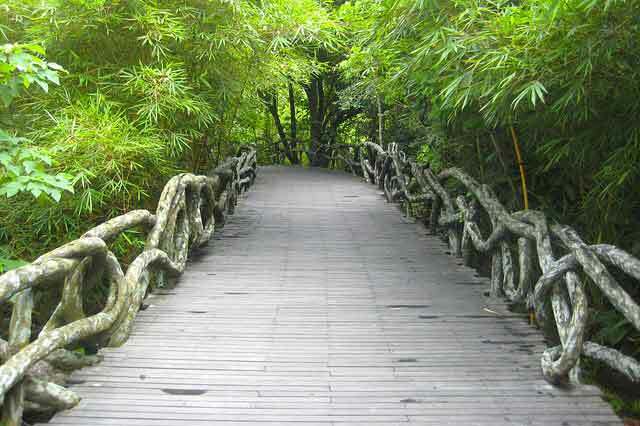 Diaoluo National Forest Park is one of 6 tropical rainforest regions in Hainan. The highest peak, "Triangle Mountain" stands at 1519 m tall. 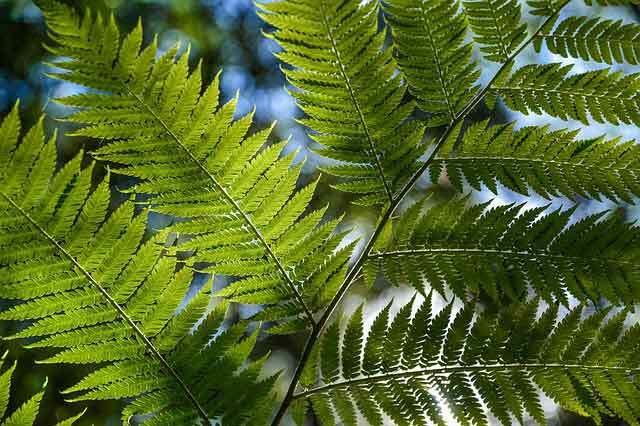 There are in excess of 3,500 different species of plants, 250 species of flowers, 112 different species of birds and 34 different species of animals. The park is probably best known for its spectacular waterfalls, the most famous being the 100-meter-high Fengguoshan Waterfall cluster. 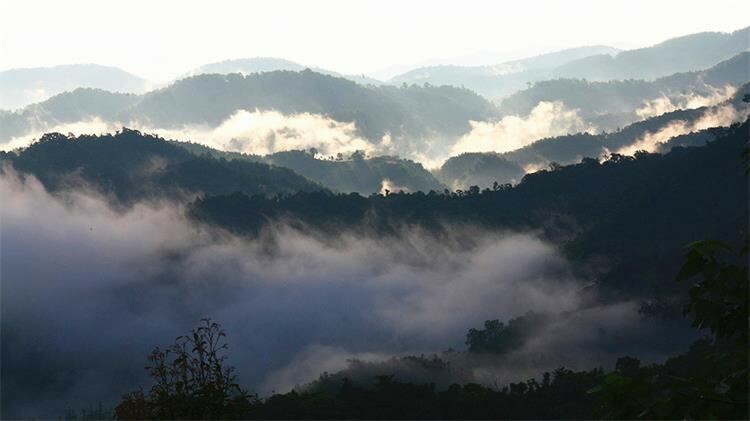 Bǎotíng Li and Miao Autonomous County, (along the centre line), is one of six autonomous counties in Hainan and it’s famous for having the most perfectly preserved primal tropical rain forest in all of China. It’s an area of outstanding natural beauty that has yet to be discovered by western tourists. 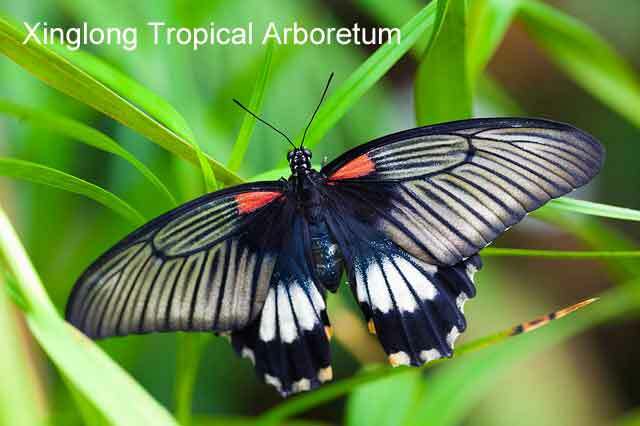 The old growth forest is one of the most biologically diverse areas in all of China and home to numerous species of plants and animals under state protection. 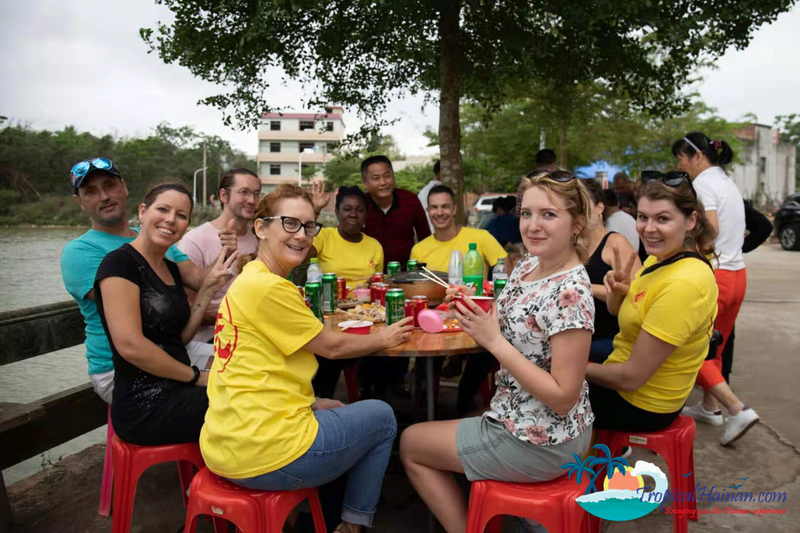 Bǎotíng is an area steeped in ancient culture and traditions, from food & drink to music & dancing to clothing & lifestyle of the local people and it is first on our list of places not to miss in Hainan. 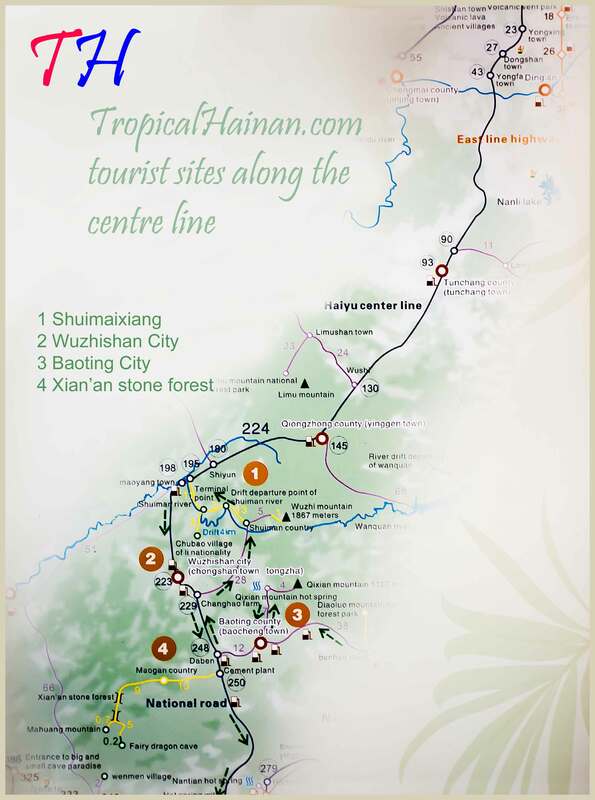 For people looking to discover more about the life of the Li and Miao ethnic minorities in Hainan, the Ganshiling National Nature Reserve is the place to come to. Villages here are surrounded by dense tropical forest and 100 year old Areca trees. 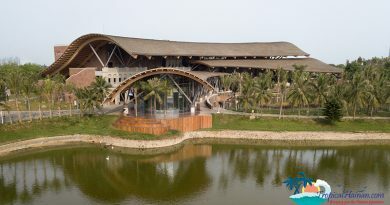 There's a museum displaying pictures and folk objects which tells the story of the history of these minority groups all set in a quiet valley that is known as one of Hainan's oxygen bars. Ya no da , meaning one, two, three in Hainanese dialect, has been a destination of choice for many ecology and bioscience students (and teachers & researchers), due to the diversity of exotic tropical plants here. 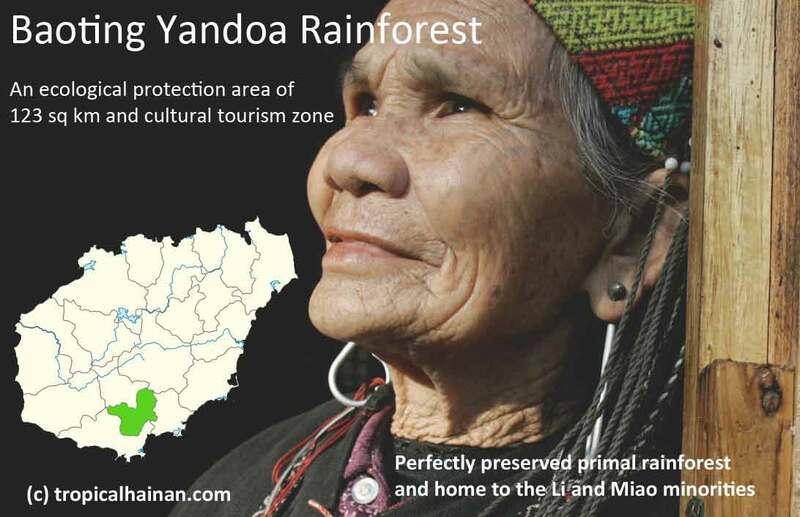 Yanuoda is a rainforest ecological wonderland with more than 3000 known species of plants, including over 1400 kinds of named arbors, over 140 kinds of South China medicinal plants, more than 80 kinds of ornamental tropical flowers and dozens of tropical fruits. 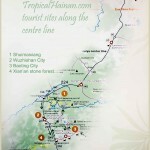 Mount Qixianling is one of the best preserver primal tropical rainforests on the island. The granite mountain with its 7 peaks is home to in excess of 5000 rare plants and 500 different species of wild animal call it home. Qixianling hot springs are famous all over China for their natural elements and health properties.. A word of caution though, the springs can reach temperatures of up to 95 degrees, so be careful and don't just go jumping in at random. Qixianling Hotspring National Forest Park, Baoting. Wanning City (No. 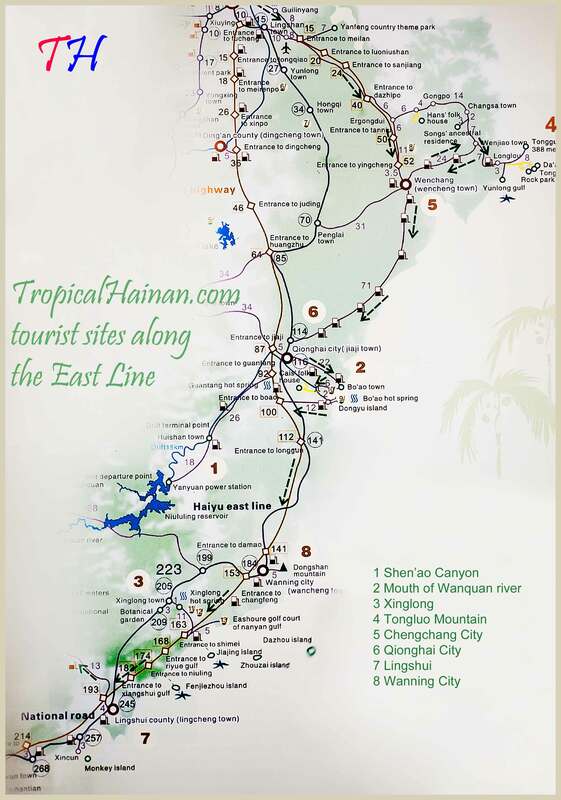 8 on the east line) is located on the southeastern coast of Hainan Island 112 km from Sanya City, it has a beautiful coastline stretching 109 km and 6 islands of varying sizes. 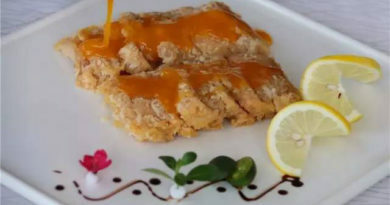 Hele crab and Dongshan lamb (actually goat), are amongst its best well known dishes. Dazhou Island is known for its edible birds nest, if that tickles your fancy and you're feeling adventurous. Wanning is also famous locally for its Xinglong coffee, which is a really nice coffee not to strong in caffeine. Located at the Huaqiao Ranch of Xinglong, the Hot Spring Resort District lies next to the Sun River. The area is fully equipped for tourists with hotels, hot springs, and various recreational facilities. 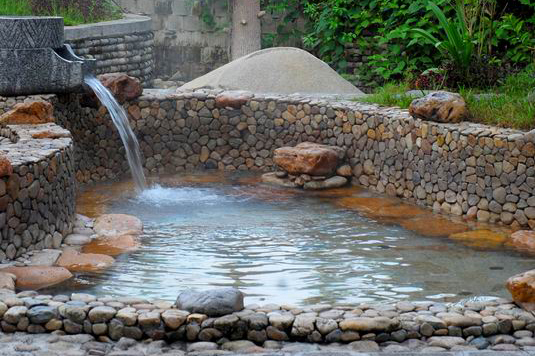 There are dozens of hot springs from natural underground mineral water said to be rich in minerals with an aromatic smell. The springs maintain a temperature of around 60 degrees centigrade all year round and are reputedly good for arthritis and skin problems. 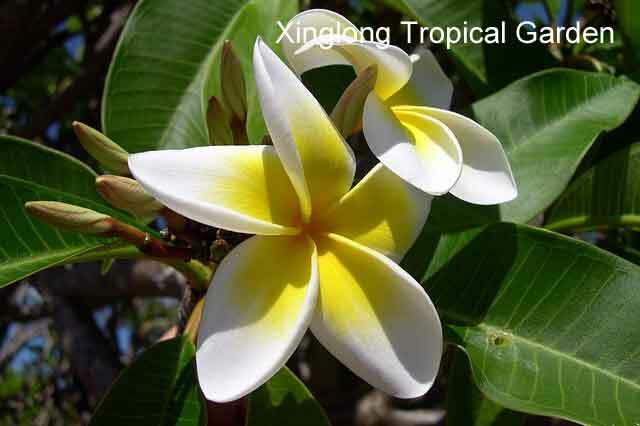 There are 3 different attractions on the site, Xionglong tropical arboretum, tropical garden and Asian ethnic culture park. Dongshan Ridge Scenic Spot, land area of 10 sq km, altitude 0f 184 metres, has historically been called "Pen Rack Mountain" in reference to its 3 peaks resembling pens in a pen holder. Ancient inscriptions are everywhere to be found on the ridge. 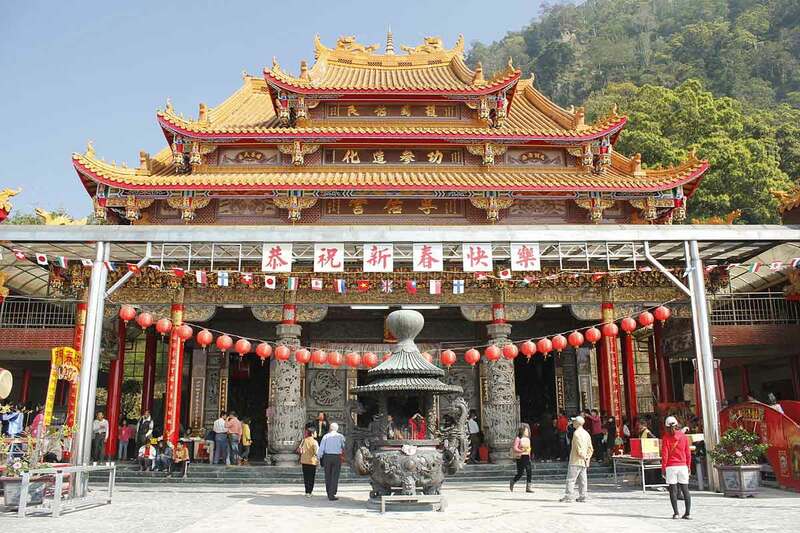 Chaoyin temple (Dongshan Fuyou Temple), is perhaps the biggest attraction; it was built in honour of Li Gang, a general from the South Song Dynasty. 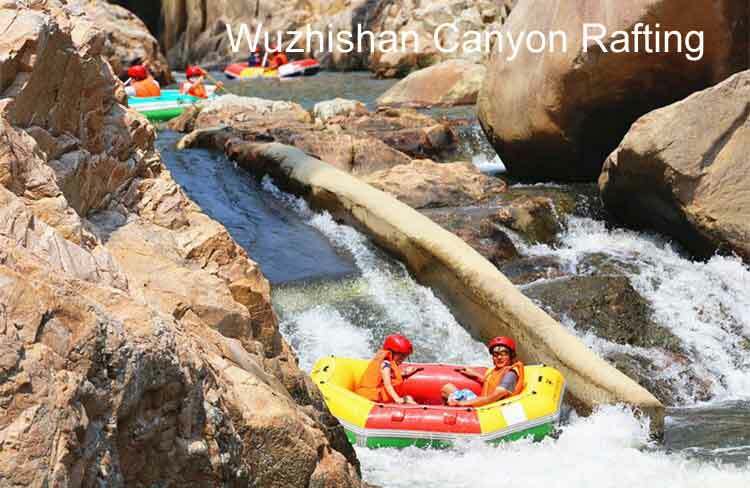 Wuzhishan City, (No. 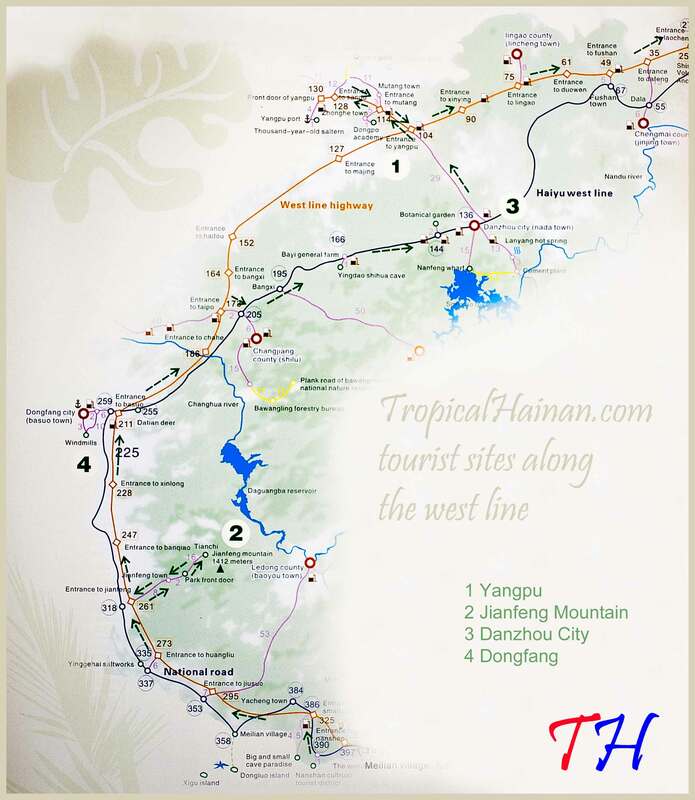 2 on the centre route), is located in the centre of Hainan and is the highest city on the island. 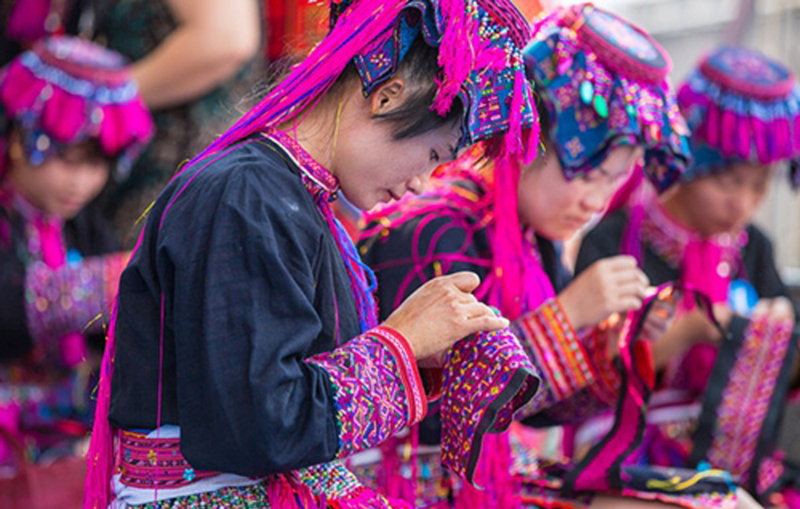 It has a population of approximately 117000 and is the heartland of the Li and Miao minorities and their culture, it is also the venue for the lunar March 3rd Sanyuesan festival. Wuzhishan mountain is home to some of the oldest trees on the island, some reportedly up to a thousand years old. 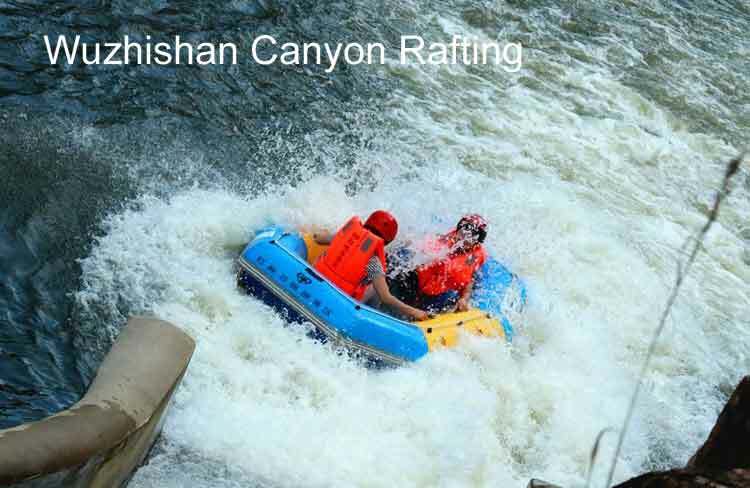 One of the biggest attractions for tourists is rafting along Wuzhishan Canyon, which has a drop of 80 metres along its length. 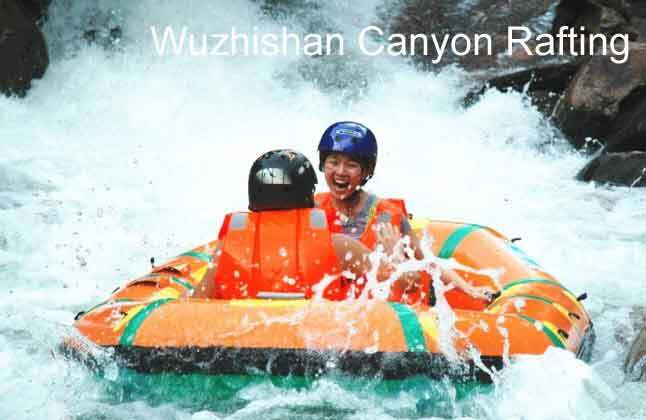 110 km from Sanya City, Shuiman Town, Wuzhishan tourism zone.